The birthdate of Saint Vitus is unknown, but it is believed that he was born in Sicily and lived during the reign of Emperor Diocletian. At a very young age, Saint Vitus became a devout Christian. 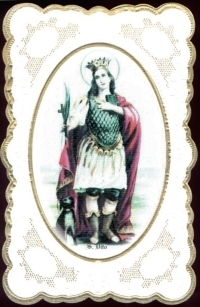 On his many travels throughout Sicily with his guardian Vitus became known to the Romans as a devout Christian that had displayed the gift of miracles. As the news spread, the Romans sought out and found Vitus. Trying to convert this high-profile child back to paganism, they resorted to various forms of torture; miracously, he survived every one. Many miracles followed the relics of Saint Vitus, especially the miracle of healing of epileptics and those suffering from chorea.